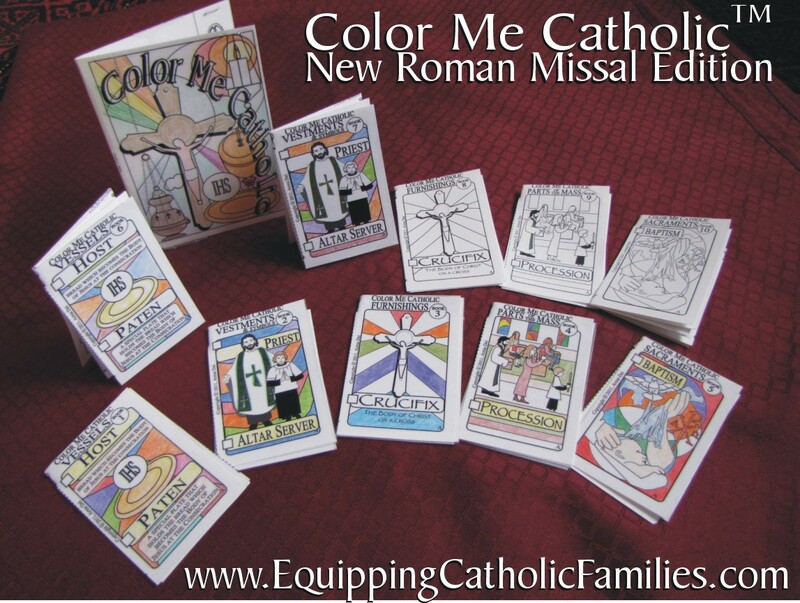 I was given the privilege to receive a free download of the new Color Me Catholic: New Roman Missal Edition craft kit in exchange for a review. Color Me Catholic craft kit was created by Monica at Arma Dei, Equipping Catholic Families. Since I wanted to learn the new Roman Missal with my children that just began on the first Sunday of Advent, Nov. 27, 2011, I was excited to be able to review a product that would help my family learn about the new changes and responses. The full collection of booklets (there are 10 small booklets in all) are created by downloading the black and white images and then printing them from your computer. The pictures below shows the cover and the back of the folder that holds the booklets which was colored by one of my children. As stated on the product page the kit includes: Instructions and templates to create 10 mini-booklets, each offering 8 mini coloring pages of treasured Vessels, Vestments & Symbols, Church Furnishings, Parts of the Mass and Sacraments & Sacramentals plus 8 pages of phrases from the New Roman Missal Mass in sequential order. A template is also included to create a folder to hold the booklets. The full collection allows for exposure to most of the text of the Mass (especially all the "People's Parts") and many images, easily reviewed over 10 Masses. Why not re-circulate the booklets for the next 10 Masses, for even better familiarity, getting kids to look and listen during Mass? The instructions were clear, but a great amount of concentration was needed in order to make sure I was printing the pages correctly and folding and cutting correctly. I had a few questions for Monica about the assembly, but she was always prompt with her replies and so helpful so that I could begin using the booklets. I would highly recommend viewing the YouTube tutorial video also which can be found on the left side of the product page HERE. Once I printed all the booklets out, I had my children color a section of the booklet as we discussed the images and read over the Mass texts. Here are some of my children coloring as we discussed each booklet. My thoughts: I enjoy using Monica's product with my children. These Mass booklets are a perfect size for little hands and material is covered a little at a time to keep children's attention without being too overwhelming. My children will be using these booklets and coloring them a little at a time as we review the Mass responses. I will be using Color Me Catholic: New Roman Missal Edition as weekly guides to teach during our religion classes during our homeschool days. I think the more we use them the more familiar our family will be with the new mass responses, which is the intention of the product. If you would like to read another review about this product, be sure to go to Laura's blog at Day by Day in our World and read her review HERE. Jennifer also wrote a review at Crafolic. Disclaimer ~ I was provided with a copy of Color Me Catholic: New Roman Missal Edition! to facilitate this review. No monetary compensation occurred and all opinions are my own. Those booklets are so neat. Your cupcakes did a wonderful job coloring them. Monica is very talented at making these. Hi Tracy, I just saw your comment on my Holy Family felt doll craft and thought I'd stop in to see you. We used Monica's books, too. I just posted my review last night! They were defiantly cute/helpful books! Great blog BTW! God Bless! Thanks for adding a link to my review, I have also added a link on my review to you. Take care and have wonderful Christmas season!